I finally broke down at the oh-so-chic Green Hills cosmetic emporium with the equally-as-chic name - Private Edition - and bought a bottle of Moroccan Oil for my hair. I've been reading about it for years. Everyone uses it, don'tcha know? All the celebutantes and glamouratti sing its praises. 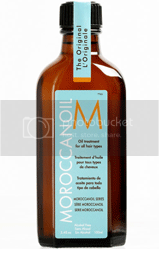 "I never leave the house without Morroccan Oil in my hair," cry all the starlets and supermodels. Whatever did Cindy Crawford and crew do in the 80s when all they had at their disposal was mousse? Regardless, I hurried home with my $16 sample size bottle (no need to splurge $40 on the full size - what if - ahem - it didn't work?) and gave myself a quick wash followed, of course, by a deep condition. This fine and frizzy genetic betrayal upon my head insists upon it. With the towel upon my head, I feverishly read the box for instructions. The first red alarm on the box states: MADE IN ISRAEL. Now, I know I barely squeaked by with a public school education, and geography was not something I was ever taught much of. However, I am pretty sure that "Israel" and "Morocco" are not synonymous. Why not Israeli oil? Sure, it sounds like something my bubbe might have added to her matzo ball recipe but it could still work for hair, yes? On to the box: I actually can't remember the specifics but it did tell me to use it while my hair was damp. I put a dab in the palm of my hand and I worked that oil like Rupaul in 1993. Then, I went about my business and let my curls dry naturally like I always do. When I went back to the mirror to check out my new hair - feeling like Jan Brady when she wore that fierce brunette wig to Lucy Winters' birthday party - me and my 'do looked exactly the same. I don't know why this surprised me. I guess I was swept away by the exotic Moroccan-ness of it all. Like I would suddenly look in the mirror and morph into Gisele (or Rupaul - I'll take either). I did notice, though, that the smell of this Israeli potion is to die for. Or, to. Die. For. Which again brings me back to the 80s when I used an actual shampoo called GEE YOUR HAIR SMELLS TERRIFIC. Somehow, Moroccan Oil just sounds better. And I'm pretty sure it smells better too.